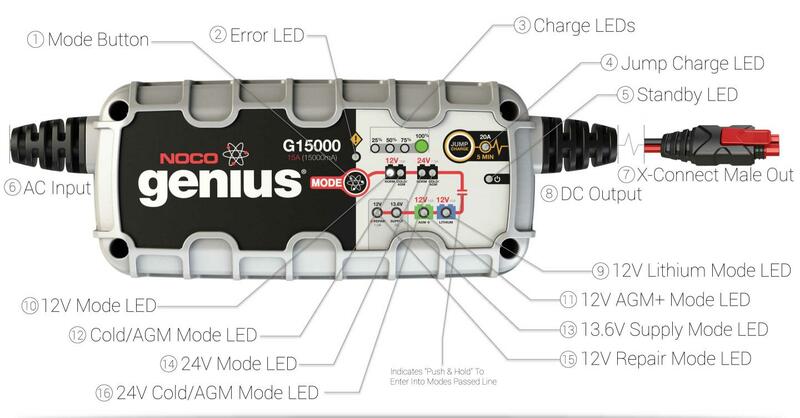 Read below for an overview on the G15000 Smart Charger. The Mode Button allows for switching between different smart charging options. All error conditions are displayed with the Error LED and Standby LED flashing back and forth. The number of flashes between each pulse denotes a potential Error Condition (except reverse polarity and low-voltage battery). The Charge LED indicates the connected battery’s state-of-charge. It will "breathe" red while charging, and turn solid green when the battery is fully charged. The Jump Charge LED indicates that the charger is ready to jump charge a battery. This mode will jump a dead battery and start a vehicle engine. The Standby LED indicates that the charger is in standby mode. No charging is happening when this light is illuminated. The AC Input draws electricity from any standard outlet into the Genius Charger. The X-Connect male end allows for a variety of accessories to be connected individually. The AC power from the outlet is converted to DC power and directed to the male X-Connect end. The 12V Lithium Mode LED indicates that the charger is in 12V lithium mode. Some motorcycles and electric cars carry lithium batteries. Double check that your battery is a lithium battery before using this mode. The 12V LED indicates that the charger is in 12V mode. This is the most common car battery voltage. The 12V AGM+ Mode LED light indicates that the charger is in 12V AGM+ mode. This is for advanced AGM batteries that require a higher than normal charging voltage. The 12V Cold/AGM Mode LED indicates that the charger is in 12V cold/AGM mode. High-end vehicles that require more power for tasks (such as heated seats, heavy sound systems, power-hungry engines, etc.) may carry AGM batteries. Double check that your battery is an AGM battery before using this mode. The 13.6V Supply Mode LED indicates that the charger is in 13.6V supply mode. The mode provides 13.6V of direct current to any plugged in device. This mode is suggested for any 12V accessory (such as a tire pump, certain electronics chargers, etc.). The 24V Mode LED indicates that the charger is in 24V lithium mode. Some vehicles that run purely on electricity will carry a 24v battery (such as a personal scooter) Other large vehicles that require massive amounts of power will carry a 24V battery (such as a trolling motor). Double check that your battery is a 24V battery before using this mode. The 12V Repair Mode LED indicates that the charger is in 12V repair mode. Repair mode is for batteries that may have a large sulfate build-up and have poor functioning cells. This mode will reverse the damage and restore life to most batteries (some may be too far gone to repair, if that is the case the battery should be replaced). The 24V Cold/AGM Mode LED indicates that the charger is in 24V cold/AGM mode. High-end vehicles that require more power for tasks (such as heated seats, heavy sound systems, power-hungry engines, etc.) may carry AGM batteries. Double check that your battery is an AGM battery before using this mode.